Bruno Walter would conduct Egon Wellesz’s cycle of symphonic poems based on Shakespeare’s ‘Tempest’ in Amsterdam on the very day that Hitler marched into Vienna. A return was unthinkable for Egon Wellesz or Bruno Walter. The Concertgebouw Orchestra was managed by Willem Mengelberg’s nephew Rudolf, himself a composer and musicologist. 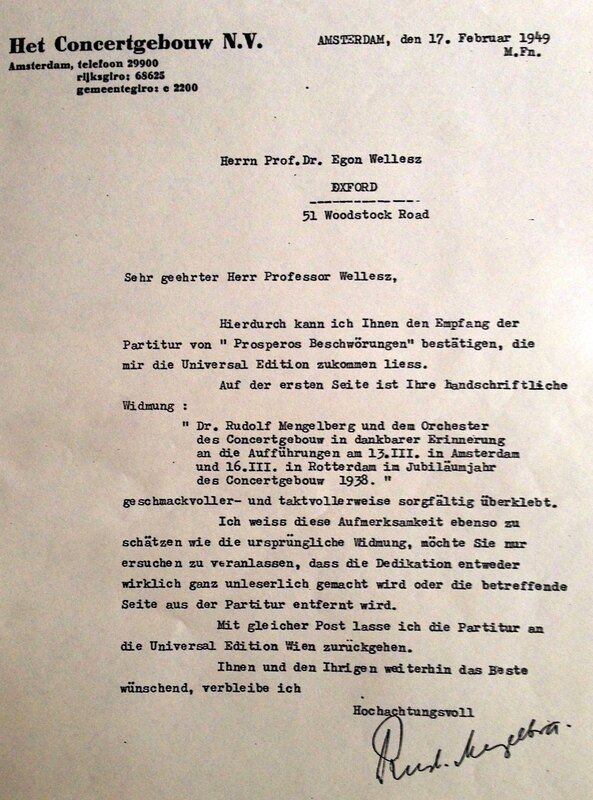 The questionable behaviour of the Mengelbergs during the war must have been the reason that Wellesz took the extraordinary step of rescinding his dedication of the work to Rudolf and the orchestra. On Youtube, (and for those who speak German) there is a remarkable interview with Willem in Munich in 1936. Hitler had been in power for three years. To hear him discuss Rembrandt, after reading the article regarding the Mahler festival and Mengelberg’s enthusiasm for Rembrandt in Mahler’s 7th Symphony must have been a sobering experience for Wellesz. I hereby confirm receipt of the score of ‘Prospero’s Beschwörungen’ which was sent to me by Universal Editions. This has been tastefully and tactfully pasted over. I am in the position of appreciating both the significance of this courtesy as well as the original dedication, and would request only that you either assure that the dedication is rendered completely illegible or that the page is removed from the score. With this letter, I enclose the score to be returned to Universal Editions.